Since 1961, we have met some of the most creative, inspiring, and all around wonderful clients. Here is a little of what our clients, our collaborators, have to say about us. A previous customer? We love to hear from our customers; nothing is more important than hearing your feedback. 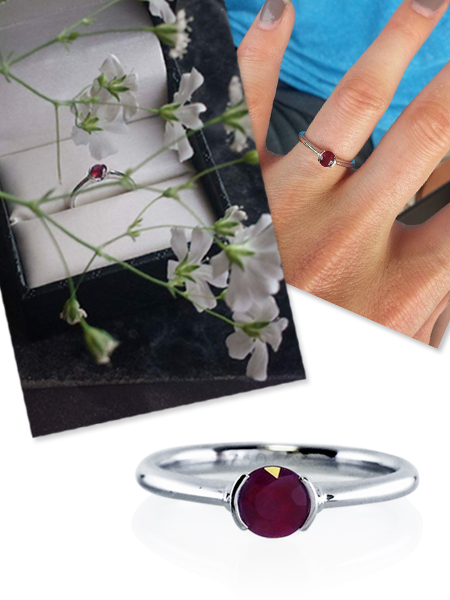 Email us a picture of your custom made jewellery and let us know how your experience was. I asked K. about 2 weeks ago, just before we went on vacation to Newfoundland. She said yes and we have just gotten back from our lovely post-engagement camping trip. 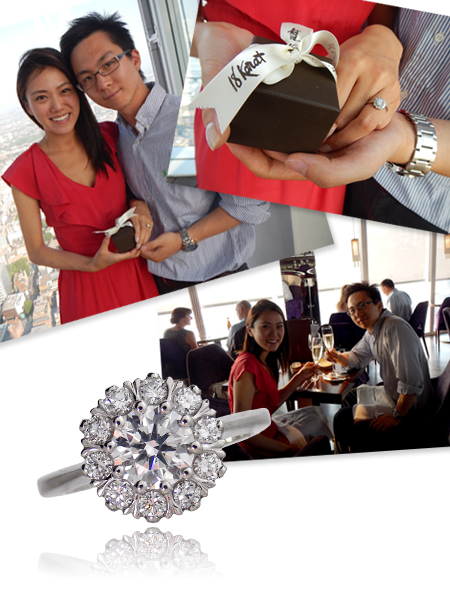 I wanted to thank you again for everything--she loves the ring and it fits very well. Attached are two photos, not the most artistic but I thought you might like them. K. has had no end of compliments on her ring, she absolutely adores it, it sparkles like diamond, changes colour as it refracts in different light. The cut of the stone is perfect and fits the setting beautifully. Absolutely everyone questions what the stone is, complimenting how the colour is so different from any other engagement ring and naturally, they ask who made it - 18 Karat. 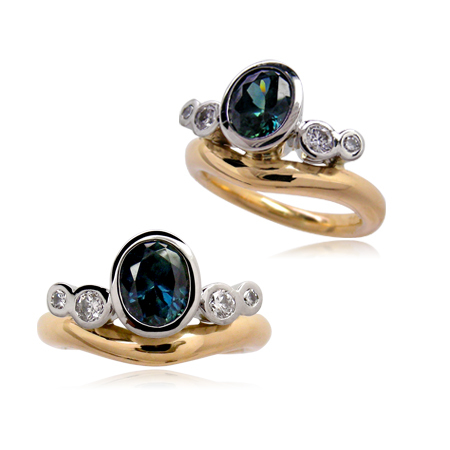 I would highly recommend 18 Karat to anyone, both the quality of the artists that they showcase in their gallery and shows and the fantastic craftsmanship of their custom that became so evident over the process of having a ring made. Really really happy, and really happy to have found you guys! Hi Vanessa. J. is in love with her engagement ring. It looks wonderful on her too. Thanks to everyone at 18Karat for making magic out of two old rings. 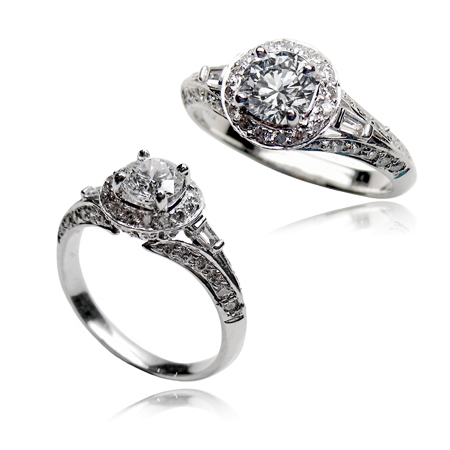 The wedding ring is a perfect fit for the diamond. The wedding ring looks good on its own too. Thanks to you and the rest of the creative team for the fine craftsmanship. It is a big success! We wanted to express to you our gratitude with the symbols of love you created for us. We can't tell you enough how impressed we are with the final product and your professionalism. We look forward to creating more special memories with you. M. and I love the rings! 18Karat will now and always be at the tip of my tonge whenever family, friends or anyone within shouting distance needs a referral. What 18Karat does particularly well is not the ubiquitous but the truly unique. Don't be fooled by their humble digs; these folks know what they're doing and they do it beautifully. 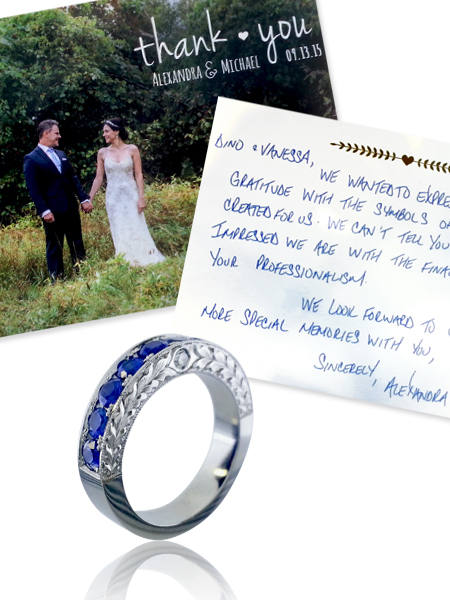 We had the pleasure of working with Vanessa Laurin, who assisted my fiance in designing our engagement ring, a tall order for a couple that works passionately in design. They devised a ring I can only describe as being both modern and timeless while harbouring the soul of a rebel. 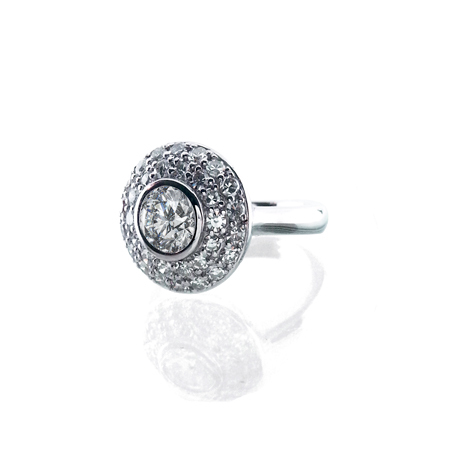 We could not be more pleased with 18Karat's ease of process and the perfection of the result. I think I can safely say we will be back for the wedding rings! Our sincere appreciation. 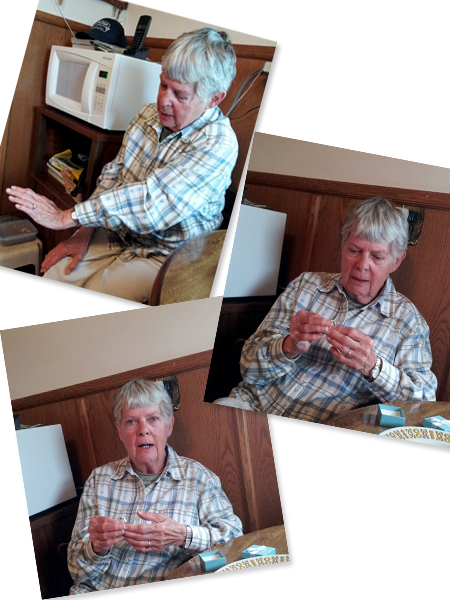 The rings arrived safely and I couldn't wait to give them to my mom! !…When she opened the box….she looked and said….oh my god …these look like my rings….and then it sunk in…..and she got very emotional……she was so appreciative ….and I am appreciative of the work that was done……absolutely beautiful……she told me later…..she could not stop looking at them….she said…..they are more beautiful now then the day your dad gave them to me and laughed!!! !….so again….my heart felt thanks for the fantastic job Dino did….I cannot be more happy with the result!!! If you're looking for custom work, top notch quality and exceptional customer service, your search has ended. 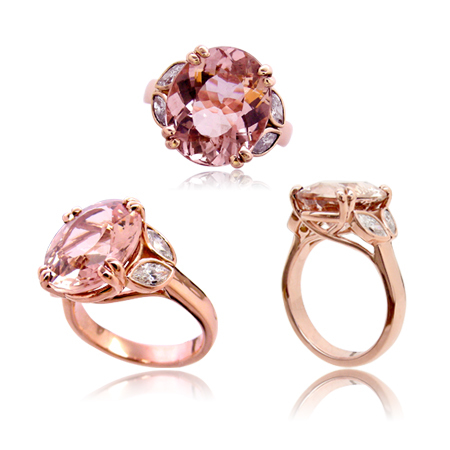 18Karat recently designed the most stunning ring for my husband and I, in celebration of our 10 year anniversary. The entire process from the first email to the last, from phone calls to in person meetings were all relaxing, informative and hassle free. We very much enjoyed our dealings with 18Karat and will absolutely use their expertise in the future. Highly recommend! 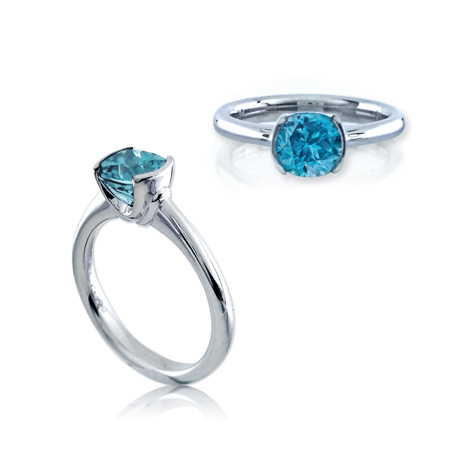 Thank you 18Karat for creating the perfect engagement ring. I couldn't remember if I had sent a testimonial or not, but here it is! 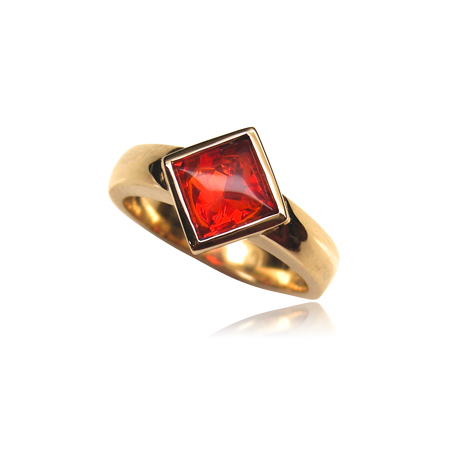 You may recall that my (now) husband and I had our rings made by you - mine is now featured on the custom design ring page - (18 karat gold, diamond and ruby ring). Then you amazingly created a channel set diamond band to go with it, despite it's odd shape. I get compliments on it all of the time! It looks just as amazing as the day it was put on my hand, and we cannot thank you enough for the amazing work that you did. You are an incredible artist and phenomenal at your craft. 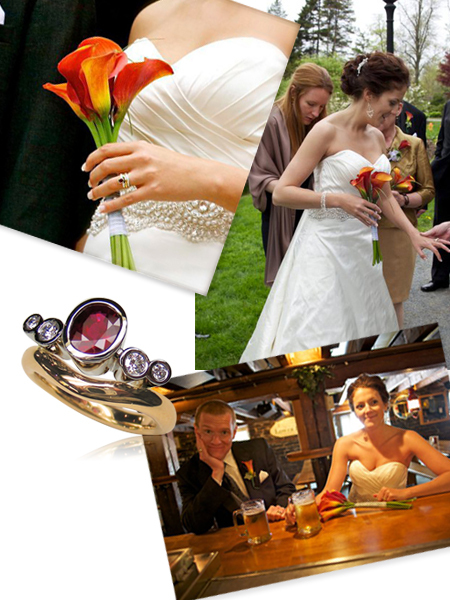 I have attached a couple of photos of our Halifax wedding (featuring the rings) that took place in May of 2011.
truly exceptional due to your fine craftsmanship and attention to detail. Additionally, your friendliness and quick turn around time made working with you a pleasure. We would whole-heartedly recommend your work to anyone!